Mink River was a total surprise and a pure joy! The action takes place in the fictional Northwestern coastal town of Neawanka. The narrator, twelve year-old Daniel Cooney, tells the story of his Irish-Salish-Indian family and how their lives intertwine with the environment and a cast of lovable and oddball characters. For starters, there’s Moses the philosophizing crow, Michael the opera loving cop, and Worried Man, Daniel’s ailing grandpa who literally — at least for purposes of this book–feels other people’s pain. 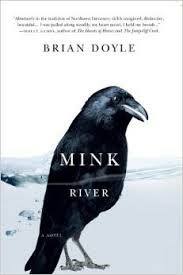 Maybe it was a little magic, some slight of hand, an unusual point of view and myth- making mixed with writerly skill, but Brian Doyle seduced me into reading a novel that might be characterized as an extended poem. I cried at the beauty on his words, and because of a heart-gripping speech that salutes a good man’s act of bravery and because, at that point, I was sad to only have nine pages left to read. Doyle’s descriptions of the Northwest’s flora and fauna are nothing short of wondrous. He takes readers out on the pulsing sea, into the woods to hear the silence, then up the mountain to meet the animals, taste the berries, feel the rain, or witness the sky changing colors. Despite incorporating a some biology, geology and ecology (to name a few), in no way is this a slow-paced or plodding novel. There are heart racing and sometimes heart wrenching episodes about bullies, child abusers, risk takers and life’s many challenges, and Doyle writes about them in exceptional ways.